At the 1992 ASPAC conference at California Polytechnic State University, San Luis Obispo (Cal Poly San Luis Obispo), the ASPAC Board voted to establish the John and Mae Esterline Prize to encourage student participation in ASPAC conferences and to recognize the support given to students by our colleagues John Esterline (1916-1996) and Mae Esterline. 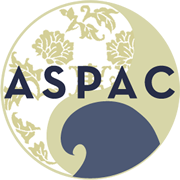 The name of the award was changed to the ASPAC-Esterline Prize and then to the ASPAC- Mori Prize in June 2014, in honor of Professor Barbara Mori of Cal Poly San Luis Obispo. The John and Mae Esterline Prize was a prize given to recognize graduate student scholarship. It was open to all students pursuing graduate studies in any discipline, at any American university and in any area of research pertaining to Asian Studies. The scholarship was awarded to students who were to present papers at the annual ASPAC Meeting and was contingent upon presentation at the ASPAC meeting. The awards were given at the meeting. Born in Cincinnati, Ohio, John Hanly Esterline received a Bachelor’s degree from Stanford University and embarked on a journalism career as a cub reporter for the Alhambra Post Advocate and later the Los Angeles Examiner. In 1942 he partnered up with Mae Handy. He enlisted in the Army and served as a First Lieutenant in the Combat Engineers during World War II. Following the war, he completed master’s and doctoral degrees in political science at UCLA and subsequently taught at Tulane University and the University of Miami. In 1951, John took a sabbatical from teaching to become a senior Foreign Service Officer, serving in India, Sri Lanka, the United Arab Republic (Egypt and Syria) and the Philippines. Between foreign assignments he attended the Air War College in Montgomery and was deputy Director of Personnel of the United States Information Agency in Washington, DC where he was responsible for the world-wide assignment of the agency’s personnel. From 1965 to 1970 he was director of East Asia and Pacific programs at the State Department’s Bureau of Educational and Cultural Affairs where, among other duties, he administered the Fulbright exchange of persons in East and Southeast Asia. Following his retirement from the Foreign Service in 1970, John resumed a teaching career as a professor of political science at California State Polytechnic University in Pomona. For 10 years he served at chairman of the political science department. During his 20 years at Cal Poly he was visiting professor of diplomacy at National Chengchi University, Taiwan (1975-76). John continued to teach as an adjunct professor at Cal Poly until shortly before his death. Not only did he continue to teach but continued his travels to Asia and continued to produce scholarly works. John is the author of several articles the last three of which were among the first to address the post-war rehabilitation of Vietnam. He has also co-authored: Inside Foreign Policy, an analysis of the Department of State, and with Mae, two editions of How the Dominoes Fell: Southeast Asia in Perspective and most recently, a lighthearted story of their experiences in the foreign service entitled Innocence Abroad: How We Won the Cold War. He was active in APSA, AAS, ASPAC. He and Mae were the first sponsors of the ASPAC selected papers program. John always maintained his interest in student’s progress. A gentleman, scholar, diplomat, educator, Old Asia Hand, John Esterline died peacefully in his home at 4:30 on the morning ofSeptember 27, 1996. The cause of death was cancer. He went as he lived, with class. Biography contributed by Stewart Johnson, August, 1997. © 2019 ASPAC. All rights reserved.